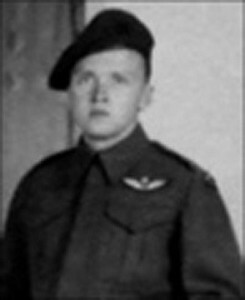 James "Mac" Macdonald Snell (1924-1991) was the son of Clarence and Louise Sutherland of Thamesford. He received his diploma from the Radio College in Toronto close to his 18th birthday and he immediately joined the Royal Canadian Artillery to become a Paratrooper going overseas and serving with the British 6th Division. He was in Germany when the war ended. After returning to Canada, he attended the University of Western Ontario and later worked with the Canadian Pacific Railway. He is buried in Zion 7th Line Cemetery, West Nissouri Township, Ontario.